I am one of the luckiest people in the world I have been around the world twice and working on a third time, but as of last year I have never been to Malta. Last fall I had an opportunity to lead a photograhic workshop in Malta. The photograph above is of the British Leyland Bus and was a from the hip grab shot. Camera is a Sony A900, 24-70mm F2.8 Carl Zeiss Lens, ISO 160, shutter speed 1/800. It is the last Leyland bus on the island. I played with it in NiK Viveza 2 software, not HDR. Its a shade over the top but I like it. So next Monday be kind to a bus and make a photograph of it, or a car, a train, a cat, or a dog. This entry was posted in camera and tagged Carl Zeiss, Leyland, Malta, Monday. Bookmark the permalink. I like this. Brings back many memories of Malta from the early 70’s. Early 70’s? Did I actually say that? 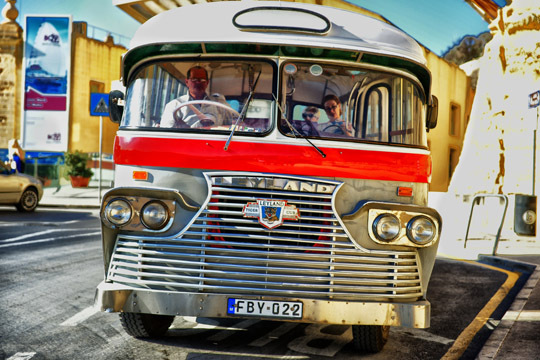 Very Nice Joe, Love old buses and great photography.